A children's book checked out in the 1940s finally made its way back to the Silver Spring library — after being overdue for 73 years. Mora Gregg, 75, who now lives in Toronto, said the book was inadvertently packed up in a move and taken to Canada when she was a girl. "I thought I really should return it to where it came from," she says. "And so I wrote a letter, and packaged it up and sent it off." WASHINGTON — The story of a how a children’s book found its way back home to the Silver Spring library — 73 years overdue — begins hundreds of miles away, in Toronto, with an early round of spring cleaning. 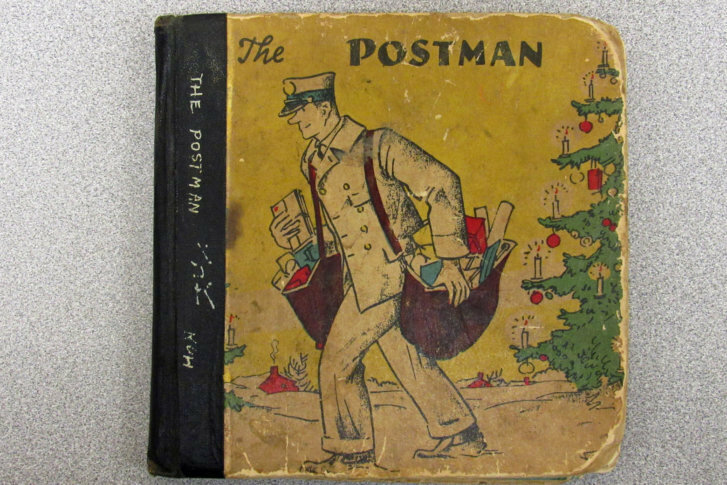 Mora Gregg was dusting books inside her apartment last month when she came across one of her childhood favorites: “The Postman,” the simple tale of a little girl’s letter journeying through the mail to her grandmother’s doorstep. Gregg, now 75, had cherished the book since she was a toddler. Originally published in 1929, some of the book’s pages had yellowed with age and the corners were worn. But the pictures — by renowned children’s book illustrator Kurt Wiese — were still colorful and vibrant. The package containing the book and a letter of apology from Gregg made a journey of its own through the mail and arrived in Maryland last week — much to the surprise of library staff there. Gregg’s letter said she believed her mother had checked the book out for her when she was just 2 or 3 years old in 1946. Librarians are used to dealing with late returns but a book being returned after seven decades is unprecedented. “This is the oldest thing I have ever seen returned to us,” Anita Vassallo, acting director of Montgomery County Public Libraries, told WTOP. And its return was unique for another reason, too. “The reason that we usually see books returned to us after many, many years is that they’ve just been lost in the house … I don’t think we’ve ever had one mailed to us from Canada,” Vassallo said. Gregg said she and her family had lived in D.C. in the 1940s when her father was stationed here during World War II. After the war, he was out of a job, and the family decided to move to Canada where Gregg’s mother was from — and the book inadvertently made the journey with them. It was her favorite, after all. And she hung on to it all through the years. You may be wondering: How much in late fees did Gregg accrue over those 73 years the book was overdue. Happily, none. Several years ago, Montgomery County Public Libraries updated its policies and did away with fines or fees on children’s materials. “So there wouldn’t have been any charge for this item,” Vassallo told WTOP. Even if it hadn’t been a children’s book, library rules also cap fees at $15 for late returns. Vassallo said that’s because the library wants people to use the library’s services and to not be afraid of racking up huge fines. In this case, the library is just happy to have the book back. However, it’s too old and in precarious condition to return to the shelves, Vassallo said. So for now, it’s being stored in the library’s administrative offices. The library doesn’t normally store historical items, but there’s talk of displaying it at the Noyes Library for Young Children in Kensington, Maryland, which is slated to undergo an expansion. For her part, Gregg said she’s surprised by all the attention the simple act of returning an overdue library book is getting. When the Silver Spring library received the package with the book, they shared photos and the story of its return on social media. Soon reporters from the D.C. area began calling the Toronto retiree. “I thought it would be fun, but I didn’t think it would, you know, hit the Washington-area news,” Gregg said. She said part of the reason she hung on to “The Postman” for so long was because it sparked a lifelong love of reading and books, which ended up making a big impact on her life. She became a university librarian and retired a few years ago. And it all started with that beloved book.